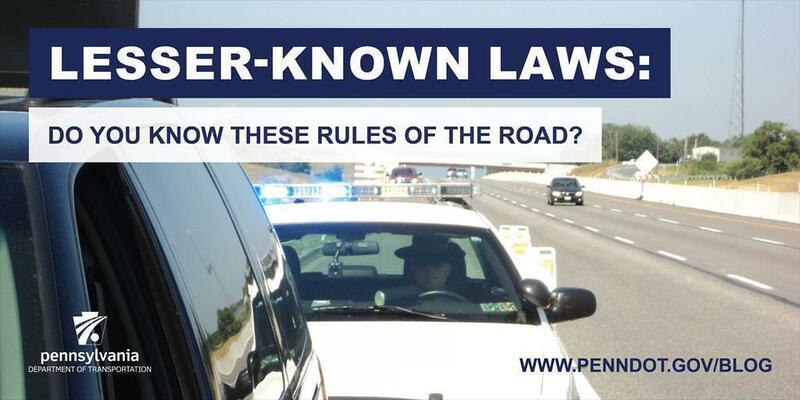 Lesser-Known PA Laws: Do you know these rules of the road? ​Highway Safety Law Awareness Week, which runs Feb. 18-24, is a joint effort between PennDOT and the Pennsylvania State Police to highlight a few lesser-known driver safety laws. "Traffic laws are enforced with the goal of keeping the public safe on the road," said State Police Commissioner Tyree Blocker. "Law Safety Awareness Week offers an excellent opportunity to educate drivers about some lesser-known regulations. It also serves as a reminder that the most important safety steps we can take are to wear a seatbelt – every trip, every time – and to never drive impaired." Title 75, Section 3549 — Blind Pedestrians: "The driver of a vehicle shall yield the right-of-way to any totally or partially blind pedestrian carrying a clearly visible white cane or accompanied by a guide dog and shall take such precautions as may be necessary to avoid injuring or endangering the pedestrian and, if necessary, shall stop the vehicle in order to prevent injury or danger to the pedestrian." Simply put, be aware of your surroundings always. If you see a pedestrian with a white cane or guide dog, slow down or stop — especially if you see them approaching an intersection. Usually, the rule is to yield to pedestrians only when they are in the crosswalk, but blind pedestrians require extra caution. Title 75, Section 3314 — Prohibiting Use of Hearing Impairment Devices: "No driver shall operate a vehicle while wearing or using one or more headphones or earphones. Exception: This section does not prohibit the use of hearing aids or other devices for improving the hearing of the driver, nor does it prohibit the use of a headset in conjunction with a cellular telephone that only provides sound through one ear and allows surrounding sounds to be heard with the other ear..."
This means you may not have both ears covered, or two earbuds in, when operating a vehicle. Having both ears covered prevents you from hearing your surroundings. Driving is just as much about hearing what's going on around you as it is seeing – especially when it comes to approaching emergency vehicles. However, drivers may use Bluetooth headsets in conjunction with their cellphone as long as it covers only one ear, leaving the other to hear surrounding sounds. Title 75, Section 3112(c) — Inoperable or Malfunctioning Signal: "If a traffic-control signal is out of operation or is not functioning properly, including, but not limited to, a signal that uses inductive loop sensors or other automated technology to detect the presence of vehicles that fails to detect a vehicle, vehicular traffic facing a: (1) Green or yellow signal may proceed with caution as indicated in subsection (a)(1) and (2). (2) Red or completely unlighted signal shall stop in the same manner as at a stop sign, and the right to proceed shall be subject to the rules applicable after making a stop at a stop sign as provided in section 3323 (relating to stop signs and yield signs)." Commonly referred to as the "Ride on Red" law, this rule was put into place specifically with motorcycle riders in mind, though it does pertain to all vehicles. Sometimes lighter-weight motorcycles won't trigger a traffic signal's sensor and the light will remain red no matter what. In any scenario, if the signal cycles through longer than 4 minutes and does not give you a green light, the driver may treat the light as a stop sign and proceed with caution. Title 75, Section 3701 — Unattended Motor Vehicle: "No person driving or in charge of a motor vehicle shall permit the vehicle to stand unattended without placing the gear shift lever in a position which under the circumstances impedes the movement of the vehicle, stopping the engine, locking the ignition in vehicles so equipped, removing the key from the ignition and, when standing upon any grade, turning the front wheels to the curb or side of the highway and effectively setting the brake." The unattended motor vehicle law is a popular one during the winter months when drivers might want to run their car to warm it up while they wait comfortably inside. This is perfectly OK ... as long as the vehicle is in your private driveway. If you don't have a driveway, or your vehicle is parked on public property, leaving it running and unattended is illegal. Even if you do leave it unattended in your driveway, make sure it's locked. The state police have had multiple reports across the state of vehicles being stolen while left idling. For more information on highway safety, visit www.PennDOT.gov/safety. Following the conversation on social media using #PATrafficLaw. PennDOT is on Facebook, Twitter, and Instagram; Pennsylvania State Police can be found on Facebook and Twitter​.